All over the world human beings are expressing their hope for what Jesus described as ‘the Kingdom of God’1. In May this year, over eight thousand young people converged on Vilnius, the capital city of Lithuania, for a meeting organised by the Taizé Community2. This was probably the first time that significant numbers of young people could come together from the former Soviet states in one of their own capitals. These thousands of individuals seeking reconciliation and building together the communion of the Church are a sign of hope, a sign that a future of peace is possible. Peace, or ‘shalom’, as any Hebrew scholar will tell you, is far more profound than the absence of war. It is a vision of a world in harmony with itself: nations reconciled to one another after generations of alienation; individuals in right relationship with each other; a sense of self-worth and fulfilment for every human being; the celebration (not just acceptance) of differences; an equal sharing, and responsible stewardship, of the resources of the earth. It is this great dream that the Church seeks to embody, no matter how often we stumble in our journey towards it. One of the great tragedies of humanity is that we grow apart from one another, and allow differences to obscure the reality of our connectedness. In the eighteenth century it was the emergence of science that became the focus for division. Christians in influential positions did not all respond in the same way. Some embraced the new ideas uncritically, while others condemned them because of a perceived (but not real) threat to the life of faith. Even today there are many who believe that science and faith are opposed and irreconcilable. But no one thing or idea is in itself the cause of division in the human family. We have to take responsibility for how we respond, and if faith is to be real it must undergo a testing, perhaps many3. Cheltenham has just played host to the annual Science Festival, a celebration of the incredible things that have been discovered through scientific enquiry. This year has also seen a recollection of the life and work of Charles Darwin, a man whose own faith was challenged, first by his theory and then by the tragic loss of his daughter aged ten. When faced with human suffering, or with any kind of challenge, it is common to want to retreat into our certainties. When we do this, whether we realise it or not, we are forgetting that a future of peace is possible, that the mystery of tragedy and of loss is a part of the greater picture of life and hope. So the Church must learn constantly to become a place where we are not afraid to doubt, to live with questions and uncertainty, and to listen with patience and attentiveness to everyone, even if their ideas seem to threaten our very way of life. Within the heart of every human being there is a longing for peace. Will we be among those whose trust not only allows us to see the future that is coming, but also to hasten its arrival? 1 See for example Mark’s Gospel, chapter 4, from verse 29. 3 The novelist Fyodor Dostoevsky once wrote: ‘My faith has been refined in the crucible of doubt’. On Sunday 28th June at 10.15am in Gloucester Cathedral, Jennifer Swinbank is amongst those being ordained to the diaconate. 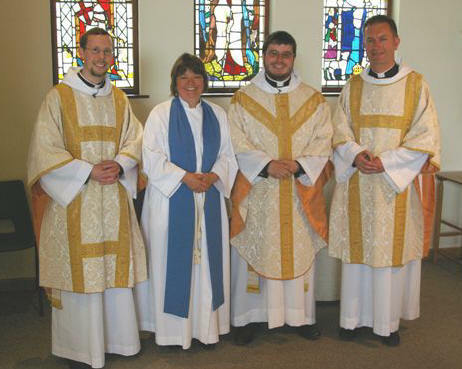 Deacon Jennifer, as she will be known, will be licensed to serve in our North Cheltenham Team Ministry. Although she hopes to be able to work across the whole Team, much of her ministry will be based at All Saints’. Please join us to officially welcome Jennifer into her new role on Sunday 12th July from 12.30pm in All Saints’. This will be a ‘bring and share’ lunch, so please bring a small plate of something savoury or sweet to share. We hope that people from across the Team Ministry will come to the lunch after their own morning services, though you are very welcome to come to the Mass at All Saints’ at 10.30am if you wish. It was good to welcome back Fr Stephen Gregory to the Eucharist at St Mary’s on Monday 1st June, the fortieth anniversary of his ordination to the priesthood. Fr Stephen was Vicar of Prestbury from 1995, also Priest-in-Charge of All Saints’ from 1999 and finally Rector of the Prestbury & All Saints’ Team Ministry from 2003 until his retirement in 2006. Members of Celebrate! agreed some time ago to sponsor a child through World Vision. We recently received a letter and card from World Vision: ‘We really appreciate the support you have given to Ousmane this year. Your sponsorship means that Ousmane and the community he lives in get access to life’s essentials such as food, clean water, education and healthcare.’ Thank you to all who help us support Ousmane in this way. 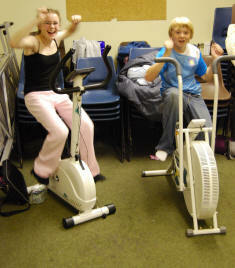 Our main aim at the all-nighter was to raise as much money as possible for the Water Aid charity. This involved there being two people on exercise bikes all night in rotation; this was a huge success thanks to everyone who took the challenge and got involved, which was good to see. After watching the Water Aid video it made me realise how important it was to raise the money that night. As well as this there were other activities such as sport, cinema, kitchen and lounge area. It was really good to see everyone take part, be good sports in the evening and to meet new people. Also it was good to see not many people fall asleep! Also, a big good luck to Stephen Murton, who is taking the challenge to bike ride to Lands End from John O’Groats. This inspired us to run the exercise bikes over the night. As you may have seen in the weekly notice sheet, I am planning to cycle from John O’Groats to Lands End in September this year to celebrate (!) my retirement. I intend doing this as a sponsored event to support the work of Andy and Sharon Macauly for Prestbury and Pittville Youth. I shall be hovering with sponsorship forms at the end of various services between now and September, and hope that you will be willing to support me in this escapade, taking advantage of Gift Aid tax benefits if possible. Following a period of consultation the PCC considered the responses which had been received and then agreed to ask the Archdeacon of Cheltenham for permission to establish a welcome area by the font for an experimental period of fifteen months. The Archdeacon visited St Mary’s in June to look at the proposed area. He indicated that he would be willing to grant the permission but would need to be satisfied that, because this is an experiment, the pews that are removed can be stored and replaced if necessary. We are currently making arrangements for storage and also investigating floor covering, which will also need be removable. When we are in a position to go ahead then we will formally ask the Archdeacon to give his permission for the fifteen-month experimental period to begin. We will let you know when that happens. Thank you to all those who responded to the consultation. We will also be asking for opinions once the welcome area has been established. On April 18th a group of eight volunteer ringers arrived at the tower to ring for the wedding of Fr Daniel and Sarah. The bride’s parents, who are also ringers and whom we had met on several occasions, found time to join us briefly in ringing on what was a very happy day. We were pleased to welcome to the tower on a recent Sunday evening eight members of the Elevate group of Prestbury and Pittville Youth accompanied by three helpers. After a short talk about the history of the bells and a chance to chime one each to get an idea of the feel and weight of a bell, the group ascended to the bell chamber where they were treated to the sight and sound of the bells at close range (ear plugs were provided!). They then watched a demonstration of six of the bells being rung in rounds. Everyone felt that it had been an interesting experience. We are into the wedding season again, with several couples requesting bells for their big day. We look forward to welcoming any visitors to the area who are ringers and who may wish to join us for Tuesday evening practices (7.30 to 9.00pm) and/or Sunday service ringing at 10.15 for 11.00am. From Thursday 10th September to Sunday 13th September St Mary’s church will be open for National Heritage Open Days from 2pm to 5pm. Our theme this year is The ways we travelled and we will be investigating all kinds of maps, roads, footpaths in and around Prestbury and of course the means by which we travelled along them. The tower will be opened by our team of ringers each afternoon, and refreshments will be served in the church. The Friends of St Mary’s will also be launched this weekend (see article below). A number of churches in our area and throughout the country have set up ‘Friends’ schemes to help with the maintenance and repair of their churches. At St Mary’s we have had a planning group who have been working towards starting a ‘Friends of St Mary’s, Prestbury’ and this will be launched in September. Membership of the Friends will be made up mainly of local residents who have affection for St Mary’s church, but who may not necessarily be involved in the religious life of the church, or people living outside the area with local connections. The Friends will contribute to the maintenance and improvement of St Mary’s church and churchyard, both by donating and raising money and by enlisting the time, enthusiasm and resources of people who can give them. All money raised will only be spent on projects approved by the PCC. If you would like more information about ‘The Friends of St Mary’s, Prestbury’ then please talk to Jim Mackie. AS I have previously explained, in spite of its pompous title, the House of Laity Meeting is the exclusive ‘talking shop’ of us lay members of the Diocesan Synod, and is very useful. On 4th June we had a lengthy and very lively discussion on the appointment of Parish representatives on the Deanery Synods and since some aspects of this have caused concern we are raising the matter at the forthcoming Diocesan Synod. This led on to a discussion which roused us all to a state of great verbal animation. You might be surprised to hear that, but it was a matter very close to our hearts: communication between church members. The definition of ‘a church’ is a building for worship. The definition of ‘the Church’ is the people involved in the worship, in our case the Church of England. The Church of England is governed by the General Synod, which consists of members of the Diocesan Synods, which in turn consist of members of the Deanery Synods. Deanery Synods are made up of representatives from the parishes, in other words YOU and ME. We are all ‘The Church’ and we all have feelings and views about our spiritual life. If we have concerns we must talk to the clergy and the PCC and our Synod representatives. They are friends and acquaintances, not strangers. They, in turn, should discuss our concerns at Deanery level, and so on up the chain. If we are not prepared to be involved at individual and parish level, then I am afraid that we cannot complain when ‘The Church of England’ displeases us. The next stage in our discussion was the machinery of the various synods. We all felt that it took some time before the workings became clear to us. A member from the Stroud area suggested a set of ‘Ladybird Book’ type of instruction booklets, one for each level: PCC, Deanery and Diocesan Synod. Then new members would have an accurate pocket book to help at the beginning instead of sitting at a loss and unable to take a proper part in proceedings. We all voted for this to begin in the new session. That is a very resounding cry for action, you must agree. Now is our opportunity to get up and do something positive. Please don’t let it slip away. As a parish we are on the move. It was a gloriously hot afternoon and we ate ice creams as we walked. We viewed Holman Hunt’s Light of the World in Keble chapel, listening to snippets of Mozart being rehearsed, admired the brickwork and huge mosaic murals. We ambled through Christchurch Meadow and sat awhile by the river watching punts and canoes, ducks and swans, and my visit ended with Evensong in the coolness of Magdalen chapel. I had arrived at St Stephen’s House theological college at ten in the morning, was immediately co-opted into the small choir to sight-read, in Latin, the alto part of a Gabrieli motet. Keeps the brain active! The service was as I remember it when I first came to St Mary’s – all responses and most of the Eucharistic prayer sung. Very nostalgic! The college and its church are tucked away almost out of sight, with a great sense of peace in the cloisters. It was interesting to meet tomorrow’s curates, about to leave college and go out to their parishes. It made me think about how we as parishioners welcome our deacons and priests. We know how we like things done in our churches, but are we perhaps sometimes too quick to try and squeeze the newcomer into our mould, rather than waiting to see what he or she brings to us? A year ago David came to us as deacon, now priest. Earlier that year Daniel joined us as team vicar, and now we have Jennifer. Each has much to offer, and not necessarily what we are expecting! ON SATURDAY 6th June I drove to Gloucester with two others to attend the Ordination to the Priesthood of seventeen deacons at the Cathedral, amongst whom was our own Father David Gardiner, tenth on the list, this order being kept throughout the service. We arrived three quarters of an hour early, yet the Cathedral was more than half full, and was completely packed, with some people sitting in the choir stalls, by 4.30 when the service began. We had good positions from which to watch and take part, and the order of service was very clearly explained in our booklets. The Gloucester Cathedral Youth Choir sang all the settings and motets, and no fewer than five of our North Cheltenham Team Ministers were present, along with many other priests, and the Bishop of Tewkesbury, assisting Bishop Michael, who conducted the whole service. After an introduction each ordinand was presented by his or her sponsor to the Bishop, who then asked the Director of Ordinands to confirm that they had taken the necessary oaths and make the Declaration of Assent. The ordinands were then called to make their declarations of pastoral duties and care, and, this done, the congregation were asked to pray for and support them. After intercessions came the ordination prayer, and the laying on of hands by Bishop Michael and all the priests who were present. Then each ordinand’s hands were anointed. I found myself to be uplifted and very excited by this most moving ceremony, that we could all witness such a devotion and faith exchanged between God and his priests. The congregation welcomed the newly ordained priests, then the liturgy of the Eucharist followed, with Holy Communion distributed from several points. Bibles were presented to each new priest before the Blessing, then they were led by the Bishop through the Cathedral to the applause of the congregation. A Joyful Day indeed! WITH THE above words Bishop Michael introduced the Liturgy of Ordination at Gloucester Cathedral on June 6th when seventeen priests to serve in the Diocese of Gloucester were ordained, including Fr David Gardiner from our Team. The Bishop continued by saying that they were to be messengers, watchmen and stewards of the Lord; they were to declare in Christ’s name the absolution and forgiveness of people’s sins; they were to preside at the Lord’s table and they were to bless the people in God’s name. However, as Bishop Bill Ind (former Bishop of Truro and of ‘Island Parish’ fame) pointed out in his sermon, priests are nevertheless human and are fallible like the rest of us. Despite that, as Bishop Bill has mentioned before, we should expect them to be honest with themselves and with others about their failings – and it is a great comfort that God only calls wonky people. Before the Laying on of Hands the Gloucester Cathedral Youth Choir and the congregation sang the Litany, which in my view made a very solemn and very suitable contribution to an impressive choral service. The Laying on of Hands was conducted with due dignity and was followed by the Eucharist, with the Bishop presiding and the newly ordained priests assisting in the administration of Holy Communion. It was a truly uplifting occasion – and when at the end the Bishop led the newly ordained priests along the nave to the applause of the vast congregation, including many supporters from the North Cheltenham Team, there on the Bishop’s immediate right was Fr David, beaming. A memorable sight! ON TRINITY SUNDAY, 7th June, I was privileged to attend a very special service at St Nicolas’ church, Prestbury. 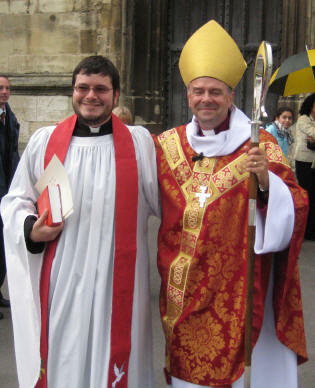 Our curate, David Gardiner, had been ordained Priest at Gloucester Cathedral the day before, and he was to preside, for the first time, at the Eucharist. As it was a benefice service, members of all five churches attended, about two hundred, I believe. It was a most uplifting service, with a great sense of ‘family’. Not only was David supported by the large congregation, but also by members of his own family. Indeed his mother, Fiona, who is a Reader in the Diocese, preached a not only spiritual, but, dare I say, entertaining sermon. I think we are very fortunate to have the Revd David Gardiner as one of the team of clergy. To complete the happy occasion a delicious lunch was served. What a wonderful service at St Nicolas’ for Fr David’s first celebration of the Eucharist! That is written about elsewhere. The following morning, in the quiet of St Mary’s, David was completely alone at the altar, no deacons (or rectors serving as sub-deacons), no one to point to the right place on the page. Yet he didn’t falter. In a congregation of just four, I found it every bit as moving as Sunday’s service. In June 1944 I was in the RAF and stationed in the flats next to the Royal Albert Hall. We were given tickets for a concert, which was in aid of the Merchant Navy, at the Central Hall. Doris Hare had a BBC radio programme called Shipmates Ashore and this was the stage version. Luckily for me, it included so many of my favourites: with singer Anne Shelton, Tommy Handley and the cast of the ITMA radio show, Eric Portman, one of our best film actors, and just about everyone else who was not working in the West End that night. We even had Wing Commander John Wooldridge, the Mosquito pilot, who had just crossed the Atlantic in under six hours! A wonderful night! A further show biz event at the Hall was more recent. The first performance of Joseph and the Amazing Technicolor Dreamcoat, in its twenty-minute version, was performed at a London school. It was decided to give it one public performance at the Central Hall and, as they say, the rest is history. Joel’s prophecy is quoted with passion by Peter when he addresses the men of Judea on the day the Apostles received the gift of the Holy Spirit. (Act 2:17). While we should continue to meditate on the gift of the Holy Spirit during the rather featureless weeks of the Trinity season, this is not my intention in this reflection. Perhaps because I shall be eighty when this is published, I observed the way the prophet differentiates between the old and the young. ‘The young will see visions and the old will dream dreams.’ One seems to me to be active and the other passive. Visions are of the future, of the potential for activity, while dreaming is associated with advancing years, sitting by the fireside thinking back over the past and what might have been. There must be more to one’s final years. There is. There are two bible study groups, both meeting on Tuesdays: in St Mary’s church at 10am most weeks and in All Saints’ church at 7pm roughly every other week. Please see the weekly notice sheets for exact details of dates during the summer months. Our final youth sessions are on Sunday 12th July. Youth work restarts next term from Sunday 6th September. Many thanks to all who have contributed to a great year! Celebrate! (St Mary’s 9.30am) and the Sunday Clubs (St Nicolas’ 9.30am and St Mary’s 11am) meet for the last time before the summer holiday on Sunday 12th July. They all restart on Sunday 6th September. For more information about the Sunday Clubs please contact . Sunday 19th July is the date for the next bakestall, provided by the G-M team. The money raised will be sent to Every Child, who are urgently appealing for donations to help children in Ethiopia. Their letter is on our notice board for you to read. Relax in August: NO bakestall in the holiday month! Our July meeting will be our summer outing to Winchester on Tuesday 28th July. All outstanding monies due to Marion by Sunday 26th at the latest, please. Our September meeting will be on Tuesday 22nd September at St Mary’s at 7.30pm. Our speaker will talk about Energy Efficiency, which should be of interest to us all in these days of both economic downturn and global warming. Please join us even if you are not a member. With the reopening of the URC chapel, Soul Café returns on the fourth Sunday of each month. On 26th July the theme is Respect & Dignity and on 23rd August Festival & Celebration. Do join us at 6pm for these short informal sessions, refreshments included. We currently have 106 people booked to join us at our Sidmouth weekend in September. There are a few rooms vacant if you would like to make a late booking. For further details contact me. On Saturday 12th September, the Gloucestershire Historic Churches Trust (Reg. Charity No. 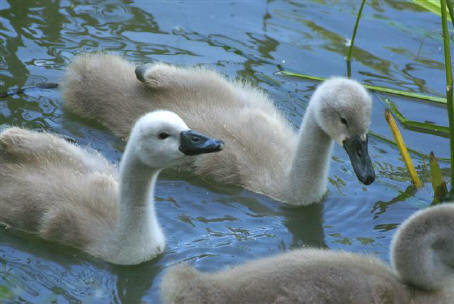 1120266) will be holding its annual sponsored Ride and Stride. Every year the Trust makes awards to church communities to maintain their buildings for worship and a significant amount of money awarded is raised through this sponsored event. We are appealing to you to help us give money back to communities which desperately need it in order to keep their churches open. 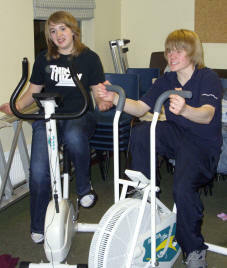 You can do this by taking part in our Ride and Stride or by sponsoring a participant. This year, for the first time, you can also choose to be sponsored to spend the day carrying out tasks in your own church or chapel. Further information, together with sponsorship forms, is available from your Local Organiser, details below. Each participant can nominate a church/chapel of their choice to receive half of their money. The cause is a good one and, although good weather cannot be guaranteed, those who take part have an excellent day. Please consider how you can best support the event.